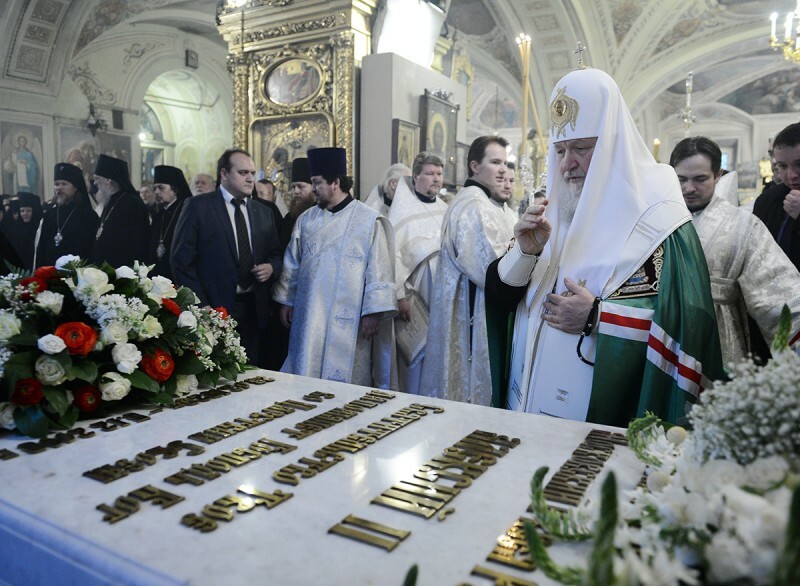 On December 5, 2013 , the fifth anniversary of the repose of His Holiness Patriarch Alexy II, His Holiness Patriarch Kirill of Moscow and All Russia performed a pannikhida before the crypt of the fifteenth Russian Patriarch in Blagoveshchensky Chapel in Epiphany Cathedral in Moscow, Russia. Praying at the service were: His Eminence Metropolitan Varsonofy of Saransk and Mordva, Chancellor of the Moscow Patriarchate; His Eminence Metropolitan Ilarion, President of the Department of External Church Relations; His Eminence Archbishop Arseny of Istrina, First Vicar of the Patriarch of Moscow and All Russia; His Eminence Archbishop Evgeny, Chairman of the Educational Committee of the Russian Orthodox Church; His Eminence Archbishop Mark of Egorievsk, Head of the Secretariat for Foreign Institutions; His Grace Bishop Serafim (Zaliznitsky); His Grace Bishop Feofilakt of Dmitrovsk, Prior of Andreevsky Stavropighial Monastery; His Grace Bishop Markell of Tsarskoye Selo; His Grace Bishop Sergy of Solnechnogorsk, Head of the Administrative Secretariat of the Moscow Patriarchate; His Grace Bishop Ieronim (Chernyshov); His Grace Bishop Savva of Voskresensk, Prior of Novospassky Stavropighial Monastery; His Grace Bishop Ferapont of Makarevsk, Acting Head of the Kostroma Diocese; Protopresbyter Matfei Stadnyuk, Rector Emeritus of Bogoyavlensky Cathedral; Protopriest Vladimir Divakov, Moscow Secretary of the Patriarch of Moscow and All Russia; Protopriest Mikhail Ryazantsev, Senior Priest of Christ the Savior Cathedral; Protopriest Vsevolod Chaplin, Head of the Synodal Department on Church-Social Relations; Protopriest Nikolai Balashov, Vice President of the DECR; Protopriest Alexander Ageikin, Rector of Bogoyavlensky Cathedral, and other clergymen of Moscow. Attending the service were also Mr Alexander Beglov, Plenipotentiary Presidential Envoy to the Central Federal District, and Mr Yevgeny Parkhaev, President of Sofrino Artistic Production Enterprise. Today we mark the fifth anniversary of the repose of His Holiness Patriarch Alexy. Five years is a period that lies at the foundation of all anniversaries, because they are always divisible by five; one could say it is the shortest of anniversaries, but still the anniversary of Patriarch Alexy’s repose. That is why we especially remember today what happened five years ago, and through this memory we span the entire history of our Church during His Holiness’ tenure as its Primate. It was a special time, a time of a sharp turning point in the life of the nation and of significant changes in the life of our Church. Most people here today remember this well and know what great difficulties the country and the Church had to face. It was during this time that Church-state relations were transformed, and the burdensome dependence of the Church on the state, which deprived the Church of the possibility of freely organizing its own internal and external life, its internal and external activities, came to an end. The opportunity arose for the episcopacy, clergy, before the entire people of faith to establish new relations with the government, and to develop their internal life in accordance with canonical norms and the pastoral demands of the time. Working side by side with His Holiness the Patriarch, I was a witness to the joys which filled his heart, and the fears and sorrows he endured, because these were not personal joys and sorrows, but those of the entire Church. Special caution was required at the time, extra prudence in word and deed, especially in the initial period of His Holiness’ service as Patriarch, when something like a revolution occurred in the nation. It was a core change of the entire order, a replacement of all elites, a shift in philosophy, when every step the Hierarchy took was very risky. On one hand, these steps opened new doors for the Church; on the other hand, they were accompanied by great dangers. By Divine mercy, the Church passed through that time with dignity, everything was done to strengthen her position with regard to the state and society, to begin to develop all aspects of Church life, to reestablish and build new churches, restore monastic life and the system of theological and religious education, perform charitable work, develop cooperative efforts with the Armed Forces, care for college students, and other spheres in Church life. During this time, when His Holiness stood at the helm of the Church, many New Martyrs and Confessors were canonized, holy saints of God, and this lends a special measure of spiritual joy to those difficult years, for the glorification of saints is always glorious for the Church, it is the glorification of the Christian way of life, the glorification of the ideal of human existence. We remember today the life and work of His Holiness Patriarch Alexy with gratitude. Over these last five years we carefully preserve his memory and pray that the Lord, forgiving his sins—for there is no man who has lived without sin—would receive him into His Heavenly abodes, and we establish eternal and prayerful memory of him in our hearts. We will continue to remember His Holiness and pray for the repose of his soul, and will bind his name with the good transformation which has determined for many years the subsequent life of our Church. I thank you all, that you gathered at the crypt of His Holiness the Patriarch to lift up our commemorative prayers for him. May the Lord preserve you.